With a series of procedures starting with a solemn ceremony in Brussels in October 1555, the aged Charles V, Emperor of the Holy Roman Empire and King of Spain as Charles I, abdicated from all of his numerous titles. His son Philip II inherited Spain and the Netherlands, while his younger brother Ferdinand I succeeded to the imperial throne. While still in Brussels, Philip II wrote to his uncle Ferdinand on 24 May 1556, informing him of his resolution to change the cipher that his father used to communicate with his ministers in Italy and other parts, not only because of being old but also because of being much disclosed, and requested the Emperor to use the new cipher he sent him. He also sent him a list of persons with whom it could be used. The Emperor responded on 8 June that he would use the new cipher in his correspondence with Philip and persons designated in the list. Joanna of Austria, Princess of Portugal, who was a younger sister of the King and who had been entrusted with the rule of Spain in May 1554, when Philip left for England to marry the Queen of England, Mary Tudor. Emmanuel Philibert, Duke of Savoy, who had succeeded to the Governorship of the Netherlands when Mary of Austria resigned with her brother Charles V.
Viceroys of Naples, Sicily, and Catalonia. Marquis of Pescara in Milan. The general cipher Cg. 1 (1556) consists of the following elements. (i) Cipher alphabet (symbols representing the letters of the alphabet). Each letter is assigned two or three symbols. Some symbols look like Latin alphabetic characters but others are more like arbitrary signs. (ii) Symbols representing syllables, which generally consist of a base symbol with signs indicating vowels: a right bar for a, a prime accent for e, a left bar for i, a plus sign for o, and a "cursive e"-like sign for u. Such symbols are defined for two-letter combinations ba be bi bo bu through za ze zi zo zu and three-letter combinations cha che chi cho chu, cra cre cri cro cru, etc. In addition, two-letter combinations ba be bi bo bu through ya ye yi yo yu are given two-digit codes 11 through 100 (the number 100 being represented as "c" instead of "100"). (iii) Symbols for double letters. Two dots over or under a symbol representing a letter indicate the letter is doubled. (iv) Nulls (insignificant symbols). One dot over or under a letter or a character indicates it is a null. The basic structure of this new general cipher was inherited from the previous reigns. Bigram/trigram codes were already used in ciphers of Ferdinand and Isabella (see another article) and combination of a base symbol and a vowel indicator is seen at least in Charles V's reign (Meister p.212). It was also used in Italian ciphers (Meister p.210, 217, 313, 435). An example of a despatch in Cg.1 is found in the following letter of Gomez Suarez de Figueroa, ambassador in Genoa, to Juana de Austria (Joanna of Austria), Princess of Portugal, (Wikipedia), who was a sister of Philip II and served as regent of Spain during the King's absence. Suarez de Figueroa to Regent Juana, 26 March 1557 (PARES) ... This appears to be a duplicate of the above. It has more lines in cipher and has various changes from the above. For example, it has an additional line at the beginning. As it turned out, this new cipher was broken in three months. The cipher used in correspondence of Cardinal of Burgos was deciphered in February 1557 (Meister p.216). The anti-Habsburg pope Paul IV had created an office of Cipher Secretary in 1555 and the office was held by Triphon Bencio until 1570 (Meister p.50-51). The Curia also appears to have used more forcible means to get a cipher of the Spanish ambassador in Rome. On the 8th the Marquis de Saria's secretary was arrested and brought to Torre de Nova, and, he hears, was compelled by force of torture to deliver to the Pope the cipher which he used in writing to his Majesty: but he is now at liberty. Code symbols are also provided: "dum" represents "galera" and something like "rap" represents "Duque d'Alba." This appears to be the same as the fragment of cipher between Cardinal of Burgos and Philip II, preserved in the Vatican and printed in Meister (p.217). Suarez de Figueroa had been using what I call "Imperial Cipher of 1555" printed in Meister (see another article). (I know no other use than the following. If it is the first cipher of Philip II rather than the last cipher of Charles V, I should move its description to this page. However, since this cipher was in use before 24 May 1556, when Philip II wrote of his resolution to change the cipher of his father's reign, there is still reason to believe this cipher was inherited from the previous reign.) It is similar to Cg.2 (1562) below in that two-letter syllables are represented by a base symbol plus a vowel indicator and the nomenclature includes numerical codes and letter codes. Suarez de Figueroa to Regent Juana, 30 November 1555 (PARES) Undeciphered duplicate. Suarez de Figueroa to Regent Juana, 10 December 1555 (PARES) Undeciphered duplicate. The letter (PARES) is undeciphered. The cipher looks like (but, of course, not the same as) Cg.6 (1571). Cardinal of Burgos used, apart from Cg.1 (1556) mentioned above, another cipher with a similar vowel indicator scheme with Colonel N.M (Meister p.217). On the other hand, the above-mentioned cipher of Cardinal of Burgos with Philip II indicates vowels with base Arabic numerals with dots and lines representing consonants. In March 1559, the King sent a cipher to Nicolo Secco (Alcocer (1934), Num. 8), who was given instructions to deal with the Turks (Emrah Safa Gürkan (2012), "Espionage in the 16th Century Mediterranean" (dissertation) p.173 n.271). The single-letter table is a monoalphabetic substitution cipher without homophones. Two- and three-letter syllables are formed with vowel indicators (dots or strokes). The base symbol is the same as the symbol for the corresponding single letter in some cases but not in other cases. The Count (later first Duke) of Feria's cipher (1558) is known, which is clearly different from Cg.1 (1556) and is described by Mattingly (1955) as "absurdly simple." The Count of Feria was a confidant of Philip II. He accompanied the King when he went to England to marry Mary Tudor in 1554, left for the Netherlands in August 1555 to succeed to the various titles of his father, and revisited England in March to July 1557. From the end of 1557, he acted as Philip's ambassador in England, with some months' break, until May 1559. (Oxford DNB; Devos p.30) In May 1558, when Mary fell ill, Feria was sent to consult with Princess Elizabeth (Wikipedia), who succeeded to the throne in November. Campillo (1951) reconstructed a cipher used in correspondence of Martinez de Ezcurra with Secretary Francisco de Eraso (14 August 1563) and Jansana, secretary of the principality of Béarn at Pau (the capital of Béearne) (6 June 1563) (p.293, 301, 303). Ezcurra was an agent (Archivo Documental Espanol Publicado Por La Real Academia De La Historia Tomo V, ) of Philip II to seek matrimonial alliance with the Queen of Navarre, who was at odds with the French court (Wikipedia). Basically, this is a simple substitution cipher with homophones representing letters with different letters or other symbols. Some (unintended?) complication is provided by those symbols which look like two letters. For example, a symbol like "rp" representing "y", one like "op" representing "n", and one line "oe" representin "r" look similar in handwriting. Campillo (1951) reconstructed still another cipher between Ezcurra and Jansana (p.294, 305) used in a letter of 9 August 1563. This is more like a traditional simple cipher with symbols including some homophones. Major persons are given codes in the form of a three-letter syllable: "fre" for "Reina de Francia", "fro" for "Principe de Conde", etc. Garcia de Toledo (Wikipedia) was Capitan General del Mar. Undeciphered. Numerical cipher, possibly monoalphabetical. Interleaving of ciphertext and plaintext will help decipher this. When Philip II took over his dominions from Charles V in 1555, the Habsburgs were at war with France. In 1557, the Spanish won a significant victory at the Battle of St Quentin in northern France. In 1559, peace was made by the Treaty of Cateau-Cambrésis and it was decided Spain and France would exchange ambassadors (Communication: Les artisans de paix). Philip II returned to Spain and entrusted the rule of the Netherlands to his half-sister Margaret, Duchess of Parma. As he left for Spain, a cipher Cp.15 (1559) was prepared for use by the Emperor, the King of Spain, and the Spanish ambassador in France. Cp.15 (1559) consists of the following elements. (i) Cipher alphabet (symbols representing the letters of the alphabet). There are three kinds of symbols. Each letter is assigned two symbols. Further, each letter is assigned a substitute letter. Furthermore, figures 1-5 are assigned to vowels. Thus, vowels are assigned four symbols and consonants three. (ii) Symbols representing syllables, which generally consist of a base symbol and signs indicating vowels. The base symbol is taken from a substitute letter in the cipher alphabet. The vowel indicators are subscript figures: Ba (k1), Be (k2), Bi (k3), Bo (k4), Bu (k5). (iii) Symbols for double letters. (v) Nomenclature. List of codes consisting of two-digit numbers (99-30) and two letters (Ba, Be, Bo, Bu, ..., Za, Ze, Zo, Zu) representing common names, words, and expressions in French. Alvaro della Quadra, Bishop of Aquila from 1553 to 1561, had been sent to England at the beginning of 1559 first as a coadjutor to the Count of Feria and acted as ambassador till 1563 (Devos p.34). [We] are now about to set sail on our voyage with the help of God. I thus advise you so that you may know where to write to me in future.... You will use the private cipher which you have for secret communications or else the general cipher which I enclose. Many of the calendared letters of the Bishop of Aquila to and from Philip II used cipher, probably the one sent on this occasion or, in 1563, Cg.2 (1562) below. One letter partially in cipher is before receipt of this cipher (Bishop of Aquila to Philip II, 12 July 1559). His letter of 26 June 1563 to the Emperor also used cipher. Apparently, the same cipher was also given to the Duchess of Parma, to whom the King entrusted the rule of the Netherlands after his departure, for a cipher was used in a letter of 21 January 1560 in CSP, Simancas, i from the Bishop of Aquila to the Duchess of Parma. Spanish ciphers were changed occasionally. Devos points out the renovation period of ciphers of three or four years is analogous to the common term of four years for ambassadors (p.62). However, it will be seen that change of ambassadors is not necessarily linked with change of ciphers. A newly appointed ambassador occasionally received an existing cipher, while, on the other hand, new ciphers were issued for other reasons more than once. A new general cipher was issued on 18 December 1562. The list of recipients now includes the Duchess of Parma. This is based on similar principles to those of Cg.1 (1556) but the nomenclature includes two-digit numbers as well as three-letter codes. To represent words, the nomenclature uses mainly three- or four-letter codes Dal, del, ..., yim, yom and numbers 20-99. Representation of the first eight words is peculiar and appears to be derived from some Latin phrase. A page from a letter of Thomas Perrenot de Chantonnay, ambassador in France, to the King dated 11 November 1563, partially enciphered with Cg.2 is reproduced on p.299 of Campillo (1951). In January 1564, new ambassadors were sent to France and England. Don Frances De Alava was sent to France as an ambassador extraordinary as a successor to Thomas Perrenot de Chantonnay, who had been in office since August 1559, to become an ordinary ambassador in 1568 till 1572. In England, Diego Guzman de Silva served till the end of 1568 (Devos p.266). A "new general cipher" is mentioned on this occasion (January 1564) but it may be Cg.2 above, which was new for Alava. When you arrive there [in Flanders] you will at once visit Madame de Parma.... For any secret things you may have to write to me or her, she will order a general cipher to be given you in which you may also write to Cardinal de Granvelle, Don Francés de Alava or whoever may be my Ambassador in France and all other of my ministers whose names you will find in it, when the necessity for its use arises. The new Ambassador to have a copy of the new general cipher as the Bishop had died when the packet containing the copy sent to him arrived in England. A letter of 10 July 1564 from Silva to Philip II used (probably this) cipher. About this time, however, the cipher was compromised and had to be replaced. Campillo (1951) reconstructed a cipher used in letters of 1562 from Thomas Perrenot de Chantonnay, ambassador in France, to the King (p.287 ff.). It uses Arabic numerals and arbitrary symbols for single letters. Two-letter syllables are mainly represented by Arabic numerals with vowel indicators. This is peculiar in that not only the Arabic numerals used are unrelated to single-letter ciphers but one numeral represents two consonants with different series of vowel indicators. For example, the cipher "2" represents a plaintext letter "a", while "2" combined with vowel indicators represents "ma", "me", "mi", "mo", "mu" but when combined with a different series of vowel indicators, it represents "va", "ve", "vi", "vo", "vu". Three-letter syllables are mainly represented by Arabic numerals 10-95 but some are represented with the vowel indicator system. This is similar to the representation of two-letter syllables in Cg.3 (1564) below. The nomenclature (the code portion) represents frequent words with two to four letter syllables. Campillo (1951) reproduces pages from Chantonnay's letters to the King dated 12 December 1562 (p.297) and 2 June 1562 (p.306). With regards to practice in cryptography, the latter is interesting because it begins with a warning "Do not break your head in deciphering this letter" because it was meant to deceive those who opened the letters and the whole of the long letter is filled with fragments of romances and meaningless phrases (p.284 ff.). As regards the cipher they stole in France from Don Frances de Alava's servant, as soon as my sister heard of it she sent me a private cipher informing me that she had sent you and Don Frances several copies which was a very good precaution to take, although directly I received news of the robbery I ordered the general cipher to be changed in accordance with a copy thereof which I enclose with this. You may write in this cipher to me or to the Ministers whose names are written upon it as also to Cardinals de Granvelle and Pacheco, to whom copies have been sent. Advise receipt of it as it will not be used in writing to you until we know it has come to hand. The list of recipients of this cipher includes the Captain General in the Mediterranean Sea. This year, García de Toledo was appointed Captain General of the Sea and Viceroy of Sicily, though, being old and infirm, he held these offices only until 1568. Cg.3 (1564) used numbers 12-43 with a dot above in the cipher alphabet. Two-letter syllables were represented by numbers 1-79, though, somehow, two-letter syllables xa through zu were represented by a vowel indicator system as in Cg.1 (1556) and Cg.2 (1562). Three-letter syllables were represented by two-letter codes. The nomenclature included numbers 12-99 with a bar above and three-letter codes: cas, ces, cus, cos, cis, ..., vos. Cipher was extensively used in the correspondence between Silva and the King. Cp.17 (1564) for use by Philip II, the Emperor, and the ambassador in France seems to be a replacement for Cp.15 (1559). The cipher alphabet including double letters was unchanged. In 1565, Francis Yaxley, employed as an agent by Mary, Queen of Scots, to go to Philip II to seek help in her cause. He reached Spain in October and obtained Philip's assurances of support (Wikipedia; Hume p.294). Silva, then in Brussels, saw him in November. When Yaxley left, he arranged with him a cipher in order to be able to communicate safely with the ambassador about Scotch matters (CSP, Simancas, i, p.508; Hume p.294). But he was never to use the cipher, for he died in ship wreck in crossing. In June 1566, an envoy of Mary, Queen of Scots, visited Silva in London on his return from Rome. Silva thought fit to ask the envoy to convey what Yaxley was to report to the Queen. After the perish of Yaxley, he had been unable to find means to write with safety. He also sent by him a secret cipher to the Queen, for convenience of communication, though he did not inform the envoy of it (CSP, Simancas, i, p.560). The cipher Num.32 of Alcocer (1935) appears to have been used in letters of the Order of Calatrava (Wikipedia), the Order of Santiago (Wikipedia), the Order of Alcantara (Wikipedia), and monasteries. The cipher alphabet is basically monoalphabetic substitution with arbitrary symbols but vowels are assigned three symbols. Syllables are assigned Arabic numerals or letter combinations: ba (1), be (2), bi (3), ..., zo (93), zu (94) (the sequence is broken by a symbol like "9Θ" assigned to "za", which is different from "90" assigned to "yu"), bla (95), ble (96), bli (97), blo (98), blu (99), bra (an), bre (en), .... No nomenclature is provided. The syllable representation is similar to that of Cg.3 (1564). On 6 August 1567, a new general cipher Cg.4 (1567) was issued. In this month, the Duke of Alva arrived in the Netherlands and soon replaced Margaret, Duchess of Parma as the Governor of the Netherlands. The recipients include Don Juan of Austria by name with a title of Captain General of the Sea (to which office he was officially appointed in 1568). Cg.4 (1567) combines the vowel indicator system of Cg.1 (1556) and Cg.2 (1562) with numerical representation of Cg.3 (1564). The cipher alphabet generally consists of numbers, though each of the vowels A, E, I, O, U is assigned a substitute letter (B, C, D, E, F) and a symbol in addition to two numbers. Two-letter syllables are represented by a base symbol and a vowel indicator but now the base symbol is the same number as in the cipher alphabet. Thus, the letter b is represented by "0" and syllables ba, be, bi, bo, bu are represented by "0" with a vowel indicator attached thereto. Further, syllables bla, ble, bli, blo, blu are represented by adding a dot above the symbol representing ba, be, bi, bo, bu. Similarly, syllables bra, bre, bri, bro, bru are represented by an underdot. The nomenclature includes two-digit codes 30-99, two-letter codes ba, be, ..., zu, overbarred two-letter codes 30-99, and three-letter codes bla, ble, ..., fin. Right after the Duke of Alva became Governor of the Netherlands, a particular cipher dated 22 October 1567 was issued for use with the Duke of Alva, Chantone (Chantonnay) (ambassador in Paris), and Silva (ambassador in London). Cp.18 (1567) is similar to general ciphers in that it has a cipher alphabet, symbols representing syllables (consisting of a base symbol and a vowel indicator), and a nomenclature. The recipients of Cp.18 (1567) were all included in the list of the recipients of the general cipher Cg.4 (1567), though not by name but by title. It was beginning to be recognized that use of the same cipher throughout the dominions had vulnerability in that carelessness in one embassy might compromise the cipher for the whole dominions. Providing ambassadors in troublous areas with a particular cipher as well as a general cipher may minimize the risk by reserving use of the general cipher for correspondence among the ambassadors and using particular ciphers between the King and ambassadors. (see Philip II to Mendoza, 18 December 1581, quoted below) However, there is evidence that both a general cipher and a particular cipher were used in the same despatch (see Cp.21 (1570) below). On 26 May 1568, a new general cipher Cg.5 (1568) (also Alcocer (1935) Num.37) was issued, of which copies of 1 July 1568 and 27 October 1569 are also extant. Again, this change of cipher may have been caused by a compromise of a cipher in the embassy in France. A secretary of the Spanish Ambassador was lately practised with by the Admiral [Gaspard de Coligny] and those of the religion, who found means by him to discover much of his master's doings and to get a copy of his cipher. The said ambassador having knowledge thereof has most cruelly tormented his said secretary and keeps him close prisoner in his house. As in Cg.4 (1567), two-letter syllables are represented by attachment of a vowel indicator to a base symbol taken from the cipher alphabet. (Somehow, y and z are represented by a non-numerical symbol in the cipher alphabet.) Unlike Cg.4 (1567), three-letter syllables are represented by attachment of a vowel indicator to numbers 17-28, which are not used in the cipher alphabet. Devos reproduces decipherment of some letters (8 April 1569 and 7 May 1569 from the Duke of Alva; 3 December 1569 and [1-5 May] 1571 from the Duke of Alva to de Spes, ambassador in England; and another undated and unsigned) written in this cipher together with some fragments in cipher (p.379 ff., 398 ff.). Cg.5 appears to be used in an undeciphered letter of 2 June 1571 of Miguel de Oviedo, secretary of the ambassador in Genoa, to the King (PARES). On 1 July 1568, the same day as the date of one copy of Cg.5 (1568), a similar particular cipher Cp.20 (also Alcocer (1934) Num.25) was issued for use with the Duke of Alva and ambassadors in France and England. The nomenclature includes two- to four-letter codes as well as Arabic numerals 20-99 and three-letter codes bla, ble, .... As with Cg.2 (1562), the two- to four-letter codes appear to be derived from a Latin passage (at least a part is taken from Terence, Adelphi, Act 1, Scene 1; Google). On 14 July 1570, a particular cipher was issued for use with the Duke of Alva and ambassadors in Vienna, Paris, and England. As with Cp.18 (1567) and Cp.20 (1568), Cp.21 (1570) is similar to general ciphers in that it has a cipher alphabet, symbols representing syllables (consisting of a base symbol and a vowel indicator), and a nomenclature. In January of this year, Chantonnay, who had been moved from Paris to Vienna, was replaced by Francisco Hurtado de Mendoza, Conde de Monteagudo (later Marques de Almazan). An enciphered specimen from correspondence between the Conde de Monteagudo and Secretary Zayas is reproduced as FIG.49 of Galende Diaz (1995). Devos observes two different ciphers are often used in the same dispatch. A letter of 19 August 1571 by the Duke of Alva to Don Guerau de Spes, ambassador in London, used Cp.21 (1570) on lines 1-23 and Cg.5ter (1569) on lines 24-32 (Devos p.69, 392). In this year of 1568, don Guerau de Spes succeeded Silva as ambassador in London and Alava became an ordinary ambassador in Paris. De Spes, however, was not informed of the cipher Silva provided to the Queen of Scots. [An envoy sent by the Queen of Scots to France] brought me two letters from his mistress to Guzman de Silva, but, as the latter has not left his cipher, or even told me that he had one with her, I have been unable to read them, and therefore send them enclosed, in order that Guzman may decipher them if he has arrived. I understand they will contain very little more than what the gentleman told me verbally, but I have kept a copy of them, and will try to get the Queen's cipher. The gentleman told me of the affliction and distress of his mistress, and, amongst other things, that the English want her and all her subjects to adopt the new religion of this country. In the end, it appears De Spes gave up locating the old cipher. I ... have obtained a new cipher with the queen of Scotland, the old one having been lost. In a letter of 18 December 1568 from De Spes to Philip II, a copy of a letter in cipher from Mary was enclosed. In 1568, Mary Queen of Scots, who had been dethroned in Scotland in 1567, fled into England to seek protection of Queen Elizabeth. However, Mary found herself held captive in England. Being a granddaughter of a sister of Henry VIII, Mary had a claim to the English throne next to the virgin Queen Elizabeth or, in the eyes of many Catholics, in place of Elizabeth, whom they believed was illegitimate. Mary was a threat to Elizabeth's throne. There was talk that Mary might marry an English nobleman such as Norfolk and succeed to the English throne after Elizabeth's death. There was suspicion towards Norfolk's intention about such a peaceful settlement and Norfolk was sent to the Tower in October 1569. As if to prove a plot, there was an attempted rebellion in the north to depose Queen Elizabeth and replace her with Mary in November. While assuring the Queen that he never dealt with any of the rebels, he continued to be in touch with Mary. When the duke in the Tower received a leter in cipher from Mary, he made a Higford a decipherer for Mary's letters (State Trials, Col.1047) and secret correspondence continued between them. He was released in August 1570. When the rising in the north failed, Ridolfi considered support from a foreign power was indispensable and sought to overthrow Queen Elizabeth through intervention of the Duke of Alva's troops in the Netherlands. The Bishop of Ross, Mary's adviser, gave his assent to his plot. The Duke of Norfolk, who was to marry Mary in the plot, was reluctant at first when the Bishop of Ross forwarded ciphered letters from Mary but finally gave his verbal approval. At the end of March 1571, Ridolfi left England and visited the Duke of Alva, Philip II, and the Pope. The letter of credence for Ridolfi from the Duke of Norfolk was in the cipher that De Spes had sent to Gabriel de Zayas, Philip II's secretary. (CSP, Simancas, ii, p.xxxiii, 300; Wikipedia in Spanish) The commission of the Duke of Norfolk to Ridolfi advised to such effect. You carry letters of credit from me and from all my friends, for his Holiness, the King, and the Duke of Alva; but as both you and the Bishop of Ross are of opinion that these letters may be dangerous both to yourselves and to us, you may leave them in the hands of the Spanish Ambassador; you will ask him, from me, to transcribe them in his own cipher, and send copies to each of the Princes, and assure them that he is in possession of the originals; giving at the same time the reasons why you have them not with you. The plot was detected while Ridolfi was abroad. After seeing Alva in the Low Countries, Ridolfi entrusted letters to the Bishop of Ross, the Duke of Norfolk, and Lord Lumley with Charles Bailly, Ross's servant, who was just leaving for England. The three letters were in cipher but somehow Ridolfi sent the key with them. Still, the letters to Norfolk and Lumley were addressed to "40" and "30", undiscovered figures arranged with the bishop before he left England. (Froude p.209-210, Collection of State Papers, Cecil p.111, State Trials Col.1008) According to the Bishop's confession, it was a cipher in Italian made by Ridolfi for writing to the Queen of Scots, the Duke of Norfolk, and the Bishop of Ross (Collection of State Papers, Cecil, p.49-50). In the end, Cecil could make him give up the keys of the cipher, which revealed valuable information, including existence of the letters removed from the packet he got hold of. Bailly was made to confess everything he knew but he could not disclose the addressees of those letters. (Froude p.219) But it was sufficient to put Ross into the Tower (Hume p.464). Upon examination, Ross made a false explanation that 30 and 40 stood for the Spanish ambassador and the Queen of Scots and he had burnt the letters (Froude p.222, Collection of State Papers, Cecil, p.14-15). Norfolk's involvement was revealed by a blunder of Higford, Norfolk's decipherer of letters (History of Parliament Online; State Trials, Col. 1047). When his ciphered letter was found in a suspicious situation and he was required to produce the key under threat of torture, he said it would be found under the mat at the door of Norfolk's bedroom. What was found there was not the key for Higford's letter but another letter in cipher written by the Queen of Scots to Norfolk (Froude p.290). Norfolk was arrested in September 1571 and was executed in June 1572. An early cipher used by de Spes is Num.24 in Alcocer (1934). It is a cipher with homophones and with a small code. It was used with the Prince of Melito, i.e., Diego Hurtado de Mendoza y de la Cerda (Wikipedia) in May 1568. This is a cipher accompanied by a small code for use with Chiappino Vitelli, Marquis of Cetona, and Roberto Ridolfi (also Alcocer (1935) Num.27). Vitelli, an Italian general in Flanders, had visited England in late 1569 ostensibly as an envoy, while actually he meant to be ready to take the command of a Spanish army upon its landing. But he was soon dismissed by the court. In July 1571, he had visited Madrid and reported the situation in England about the Ridolfi plot, before returning to the Netherlands. De Spes, ambassador in England, sent a small cipher Cp.22 (1570) (also Alcocer (1935) Num.26) to Don Juan de Zuñiga, ambassador in Rome, on 25 September 1570. De Spes was involved in another cipher Cp.23  (also Alcocer (1934) Num.9). This is a list of code words for names and expressions in Italian. A code word "Pionby" represents "Il vescho di Roso chè in Torre." This allows dating of this cipher since the Bishop of Ross was put in the Tower of London in July 1571 because of his involvement in the Ridolfi plot (Devos p.249). There is another small code in Italian (also Alcocer (1934) Num.21). The Bishop of Ross is represented by "32." The cipher Num.17 of Alcocer (1934), dated 8 March , is for use with "Espineli" (Spinelli) marked "En Londres a 8 de marzo" (Carmona p.182). The ciphers Num.29 and Num.30 of Alcocer (1934) are both dated 22 December 1571, London (also Carmona p.183). Num.29 was for use with Sanvitores. Num.30 was for use with Luis de Paz. A copy was sent to [Juan de] Albornoz, a secretary of the Duke of Alva (allacademic), in May 1572. These are all similar to Cp.22 (1570) above. Single letters are assigned one to three symbols. Double letters are also assigned symbols. Several nulls are provided (except for Num.17). The nomenclature (for Num.29) includes 40 entries representing common words and names by letters "d", "c", "f", "h" with an additional stroke or a subscript numeral. The cipher Num.23 of Alcocer (1934) is dated 2 January 1572, "Gravisenda" (Gravesend in England) (also Carmona p.183). This is similar to the above ciphers (Num.29 and Num.30). It has special symbols for "Don gueran [de Spes?]" and "Aquines." The plotting De Spes had been ordered to leave England in December 1571 and left England in January 1572, after staying for nine or ten days in Gravesend (CSP #305). The timing seems to indicate that this cipher as well as those similar to this (Num.17, Num.29, Num.30 above and Num.19, Num.22, Num.31 below) are all his. The ciphers Num.19 (Brussels, 17 April), Num.22 (Brussels, 10 May 1572), and Num.31 (Brussels, 8 May 1572) of Alcocer (1934, 1935) (also Carmona p.183) are also similar to the above ciphers (Num.29, Num.30, Num.23). Num. 19 was for use with Doctor Julio. Num. 22 was for use with Secretario Prats, who seems to be Étienne Pratz (Correspondance de Marguerite d'Autriche, duchesse de Parme, p.295 ff. ), who had assisted in the examination that led to condemnation of Count Egmont (Wikipedia) in 1567. Num.31 was for use with Terrades (Carmona) or Ferrades (Alcocer). Single letters are assigned one to three symbols (Arabic numerals, letters, or other symbols). Double letters are assigned symbols with an overbar (Num.19, Num.31) or an overdot (Num.22). Several nulls are provided. The nomenclature includes about fifty entries representing common words or names by letters with some additional strokes (Num.19, Num.22) or by letters with a subscript numeral. There is a small code in French, dated 12 February 1572, for Zweveghem [Sweveghem] and De Spes. Numbers 3-63 represents letters of the alphabet. Numbers 9-55 with an overbar represents common words in French. Numbers 67-70 with an overbar are nulls. Zweveghem had been sent to London by the Duke of Alva in February 1571 for restitution of Spanish property seized (cf. Kamen p.133) by the English. Devos reproduces decipherment of a letter of Zweveghem to de Spes dated 7 February 1572 written in this cipher together with some fragments in cipher as follows (p.407 ff.). A cipher of "Juenegheu" dated "1660" (Alcocer (1934) Num.20) is identical with Cp.25 (1575) in the numbers representing letters of the alphabet and nulls. Although the French words assigned to 9-55 with an overbar are different, there is a possibility that "Juenegheu" is a transcription error for "Sweveghem." 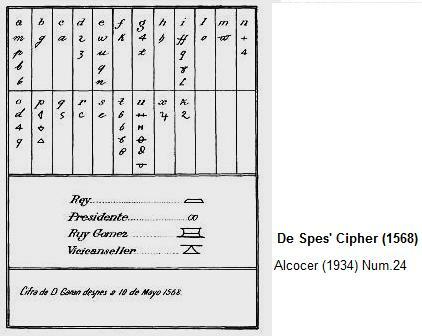 Another cipher for de Spes from this period is Num.18 of Alcocer (1934). This was provided to De Spes rather than prepared by him. It is a homophonic substitution cipher with a small code in French. It was used in a letter from the King to Chantonnay in 1572 (Carmona p.190). A cipher with Melchior (Alcocer (1934) Num.12) from 1572 (Carmona p.183) is a monoalphabetic substitution cipher plus special symbols for some names including de Spes and the Bishop of Ross. (Ciphers of Num.10 and Num. 13 of Alcocer (1934), with no names and no date, very similar to each other, are monoalphabetic ciphers with some nulls. A cipher of Francisco Inglefildo (Francis Englefield), who supported schemes for restoring Catholicism in England (Wikipedia; Dodd's Church History of England (Google)), from 1572 (Carmona p.183) is known (Alcocer (1934) Num.11). This is similar to Cp.25 (1572) in using Arabic numerals (plus alphabetic letters and barred numerals) for enciphering single letters and using Arabic numerals with an overbar as code groups. Tomas Xemis' cipher (Alcocer (1934) Num.14) from 1572 (Carmona p.183) is basically a monoalphabetic cipher plus some homophones for vowels. Arabic numerals with an underbar are used to represent some names including the Duke of Alva, the Duke of Medinaceli, Cecil, the Earl of Leicester, the Earl of "vos morland" (Westmorland? ), Marquis of Vitelli, Secretary Çayas [Zayas], and Francisco Inglefildo. As was the case with Cg.3 (1564), the update was instigated by a suspected compromise of the cipher in the French embassy. The general cipher having been so long in use and having passed through so many hands, we think it is time it was changed, particularly as Don Francés [de Alava] suspects that it has been tampered with. We consequently send you a new one, of which you will acknowledge receipt as we cannot use it until we know you have received it. The recipients now include the Lieutenant General of the Sea, the post held by Luis de Requesens. Requesens had been ambassador in Rome during 1564-1568 (Devos p.44) and the King had appointed him as a lieutenant when he appointed the young Don Juan of Austria as Captain General of the Sea in 1568. Devos reproduces decipherment of a letter of the Duke of Alva written in this cipher together with some fragments in cipher (15 November 1571) (p.395 ff.). In October 1571, the allied fleet under the nominal command of Don Juan of Austria decisively defeated the Turks at the Battle of Lepanto. A document dated Madrid, 21 June 1574 is entitled "General cipher I asked Mr Secretary Zayas in June 72 / Ayala". It includes two ciphers. The first cipher is similar to Cg.4 (1567)/Cg.6 (1571) in that two-letter syllables are represented by a base symbol and a vowel indicator; that the base symbol is the same as in the cipher alphabet; and that three-letter syllables such as bla and bra are represented by adding a bar under or through a corresponding symbol for the two-letter syllable such as ba. The second cipher has two vowel indicator systems. One uses dots or strokes, while the other uses figures 5, 4, 3, 2, 1 to represent a, e, i, o, u. Two-letter symbols have the same base symbol as the single-letter symbol, while three-letter symbols are unrelated to single-letter symbols. This document does not include a list of recipients. On 14 July 1572, a general cipher Cg.8 (1572) (also Alcocer (1935) Num.36) was issued. This is similar to Cg.4 (1567)/Cg.6 (1571) in that two-letter syllables are represented by a base symbol and a vowel indicator and that the base symbol is the same as in the cipher alphabet. However, three-letter symbols are formed by combining a plaintext letter with a vowel indicator. That is, symbols for bla, cla, fla are formed by combining capital letters B, C, F with a vowel indicator, while symbols for bra, cra, dra, fra are formed by combining small letters b, c, d, f and a vowel indicator. The nomenclature includes two- or three-letter codes and numerical codes 24-187. In this year of 1572, Requesens was appointed as Governor of the Duchy of Milan and Don Diego de Zuñiga was sent as ambassador to France. The recipients of the cipher do not include an ambassador in England. Spain had no representative in England during 1572-1578 after the aggressive ambassador De Spes was expelled in January 1572. A specimen of use of this cipher in a letter of 22 October 1572 from the Duke of Alva to the Conde de Monteagudo is reproduced as FIG.52 of Galende Diaz (1995). During the absence of a Spanish representative in England, a Spanish merchant or banker named Antonio de Guaras, who had lived in London for many years and had been providing information to the Duke of Alva, looked after Spanish interests informally (Calendar ii, p.xxxviii, 376). While he appears to have had only a simple cipher, the Queen of Scots entrusted him with her own cipher. I enclose herewith copy of the letter which I have received from the queen of Scotland and of the reply which I sent to her, as also of the cipher she had forwarded to me. This lady founds all her hopes upon his Majesty, after God, and by a letter she has written to an influential friend, who read it to me, it is certain that there is nothing she desires more than to accept the proposition about Don Juan of Austria.... If it be his Majesty's will that this matter should be considered, and communications have to be carried on with the Queen about it, this cipher can be utilised for the purpose, it being so obscure, without an alphabet, that it is impossible to decipher it. There is not so much talk about the false money for fear of its getting wind. It appears they are covering it up with silence. This cipher being so simple and easy to discover, I will write if I am allowed in that of the Queen (of Scots), which is so obscure that it can never be deciphered. The messenger who takes this is going thither for his own affairs, and as he is faithful I write this in simple cipher thus openly. He further had a special cipher for correspondence with Don Juan in the Netherlands, which was not shared with the King's secretary Zayas. Although I have advertised you in various ways that I have not the key of the cipher that you employ with Don John, I repeat it here, in order that you may at least send it, to let me understand your letters. The last (of Aug. 17, I think), both one and the other remain hidden, since I am too old to break my head by making them out without a key, as I did when I was younger. Incidentally, this letter shows that Zayas did have some knowledge of deciphering without a key. A new general cipher was issued on 21 June 1574. It is a nomenclature consisting of numerical codes 21-99, 10-99 with a bar above, another series of 10-99 with a sign like )-- above, a yet another series 10-99 with a similar sign above, two-letter codes ba, be, bi, bo, bu, ..., za, ze, zi, zo, zu and ab, eb, ib, ob, ub, .... Bare numbers 10-20 not used in the nomenclature may have been used in an accompanying cipher alphabet that is lost. In the meantime, Requesens had succeeded the Duke of Alva in the Netherlands in 1573. A new general cipher was issued on 30 May 1575. This is similar to Cg.4 (1567)/Cg.6 (1571) in that two-letter syllables are represented by a base symbol and a vowel indicator; that the base symbol is the same as in the cipher alphabet; and that three-letter syllables such as bla and bra are represented by adding a hat or a hacek to a corresponding symbol for the two-letter syllable such as ba. The nomenclature includes numerical codes 0-150 (of which some have an overbar), two-letter codes ba...zu, numerical codes 16-99, and three-letter codes bas ... vos. Particular cipher Cp.29 of Philip II is for use with Guzman de Silva, former ambassador in London, during the time of his embassy in Venice from the end of 1568 to March 1578 (Devos p.273, 266). This is similar to general ciphers in that it has a cipher alphabet, symbols representing syllables, and a nomenclature. A letter in cipher of 12 July 1579 from Don Juan de Borgia, Spanish ambassador at the imperial court of Maximillian II, then at Prague, to Philip II, reporting the Prince of Parma's seizure of Maastricht in June, is preserved in BnF fr. 15561 f.42 (to be treated in another article). The present author reconstructed the cipher from the decipherment in the margin. It is similar to Cp.29 or Cg.12 in its use of Arabic figures and vowel indicators. The nomenclature uses Arabic figures with a plus sign above as well as two- or three-letter codes. For example, 7, 41, 89, 108 with a plus sign above denote "persona", "qual", "servicio", "sa Magd", respectively. Examples of letter codes are: co ("comissarios"), xo ("officio"), cil("Emperador"), col("Emperatriz"), ham ("maner"), lul ("final"), Rom ("para"), Rum ("paraque"),sem ("negocio"). Guzman de Silva's cipher Cp.28 (1577) is for use with Don Juan de Zuñiga, ambassador in Rome from 1567 to 1579. This is similar to general ciphers in that it has a cipher alphabet, symbols representing syllables, and a nomenclature but it has some peculiar characteristics. First, in addition to the cipher alphabet consisting of arbitrary symbols, it has another cipher alphabet consisting of dotted vowels. Two systems are provided for the nomenclature, too. One represents names and words by a sequence of two or more letters: Alemania is represented by "At", Constantinopla is represented by "inver", etc. The other represents names and words by alphabetical or other symbols occasionally with a bar. The first system takes its code symbols entirely from a Latin passage (Psalm 77:1-8, Vulgate), the system employed partly in Cg.2 (1562) and Cp.20 (1568). Cipher Cp.31 of Philip II is for use with the Marquis of Aguilar during the time of his embassy in Rome from 1579 to 1585 succeeding Don Juan de Zuñiga. This is similar to general ciphers in that it has a cipher alphabet, symbols representing syllables, and a nomenclature. However, it is peculiar in that the nomenclature represents names and words by a single alphabetical or other symbol with a superscript Arabic numeral, dots, etc. In November 1576, Don Juan of Austria, an illegitimate son of Charles V and thus a half-brother of Philip II, succeeded Requesens, who had died in March 1576, as the Governor of the Netherlands. 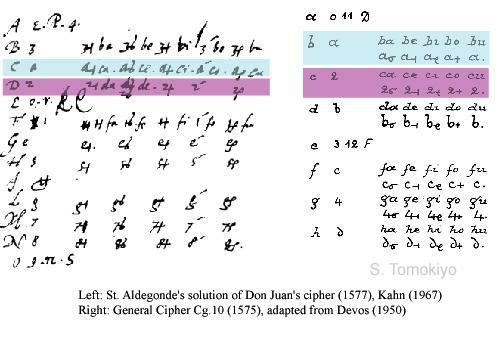 Solution of Don Juan's cipher (1577) is printed in Kahn p.120, which is similar to (but not the same as) Cg.4 (1567)/Cg.6 (1571), Cg.8 (1572), and Cg.10 (1575), all of which list Don Juan as one of the recipients. Probably, it was a general cipher issued in 1576 or 1577. Yet another general cipher was given in 1578 to Bernardino de Mendoza, when he was sent as ambassador in England to fill the blank after the expulsion of De Spes in 1572. You will also keep up a correspondence with Juan de Vargas Mejia whilst he resides at the court of France, and I have ordered him to do the same with you. You will receive with this a general cipher which is in use between us, our brother, and the other ministers whose names are attached thereto, and you will carry on your correspondence in this. Devos reconstructed the cipher from a deciphered letter from Mendoza to the King dated 19 March 1578 and a ciphered letter from Don Juan to Mendoza dated 14 March 1578 (p.414). Again, this is similar to Cg.4 (1567)/Cg.6 (1571), Cg.8 (1572), and Cg.10 (1575). It was specifically intended for correspondence with Juan de Vargas Mejia, ambassador in France since 1577, but somehow Vargas did not use the general cipher. 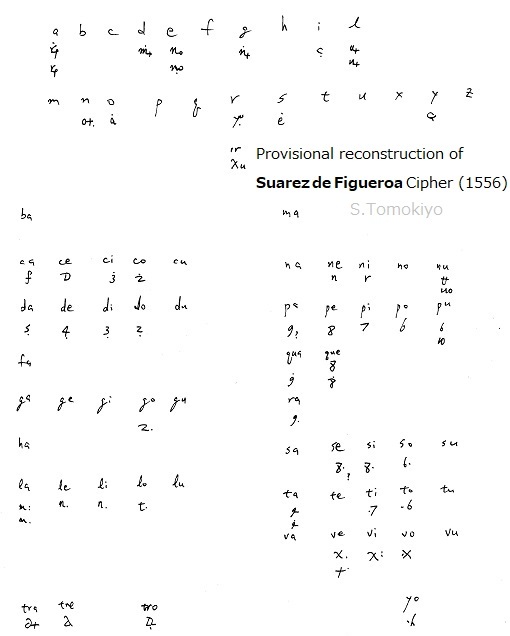 Devos provides partial reconstruction of ciphers used in letters from Don Juan Vargas Mejia to the King dated 12 December 1577 and 16 May 1579 (p.418 ff.). The cipher of 1577 includes a numerical code 6-96 for two-letter syllables as in Cp.28 (1577). The cipher of 1579 is similar to Cg.8 (1572) in that two-letter syllables are represented by a base symbol (arabic numeral) and a vowel indicator and that the base symbol is the same as in the cipher alphabet. Further, three-letter symbols are formed by combining a plaintext letter with a vowel indicator. That is, symbols for bla, cla are formed by combining capital letters B, C with a vowel indicator, while symbols for gra, fra, pra, tra are formed by combining small letters g, f, p, t and a vowel indicator. Num.33 of Alcocer (1935) is a simple substitution cipher with a few homophones and about 20 special symbols for common words. It was used in a letter to the Bishop of Cordoba (cf. Wikipedia) dated 4 March 1575. One persistent source of frustration during Philip II's reign was the trouble in the Netherlands (including today's Belgium as well as the Netherlands). Margaret of Parma, who favored moderation, gave way to the Duke of Alva, whose unrelenting harshness could not yet suppress the Dutch. Soon after the capture of Brill by a band of rebels called Sea Beggars in 1572, most cities in Holland and Zeeland were in the hands of the rebels (with notable exceptions of Amsterdam and Middelburg) and reinstated William, Prince of Orange, as the stadholder. The hardliner Alva was replaced by Luis de Requesens in 1573 but the latter died suddenly in 1576. Just about the time his successor Don Juan of Austria arrived in Brussels in November 1576, the provinces of the Netherlands, including conservative southern provinces as well as rebellious Holland and Zeeland, agreed by the Pacification of Ghent to demand removal of the Spanish troops while retaining loyalty to Philip II. Decipherment of Spanish cipher used in letters of Baron D'Aubigny, Don Juan's envoy, was mentioned as early as 3 November 1576 and 3 December 1576 (CSP, Foreign, xi). Don Juan's governorship started in a pacificatory mood. Don Juan showed the King's intention of peace by accepting the conditions of the Pacification of Ghent by signing the Perpetual Edict of February 1577 and the Spanish troops were actually withdrawn to Italy in April. However, Don Juan soon broke with the States General of the provinces and, leaving Brussels in July, took the citadel of Namur. He sent his secretary Escobedo to Spain to explain to the King the impossibility of attaining a reasonable peace. Dutch codebreaking of the Spanish cipher contributed to the distrust among the Netherlanders towards the Governor. The codebreaker was Philips of Marnix, Lord of St-Aldegonde. From 1576, Philips of Marnix, Lord of St-Aldegonde, dealt with Spanish cipher (De Leeuw). In March 1577, he deciphered Antonio Guaras's letters in about twelve days. Letters written in April 1577 by Don Juan and his secretary Escobedo to the King and his secretary were intercepted in Gascony by a Huguenot general la Noue. The letters were forwarded to the Prince of Orange and deciphered by St-Aldegonde. (ibid., xi: Nos. 1375-1379, 1400; xii: Preface, No. 38) They revealed a view that the Netherlands must be pacified by force and even an idea of invading England from Flanders. Aware of the decipherment publicized by the Dutch, Don Juan protested to the States General and repudiated the content as inventions. In the spring of 1578, England still relied on St. Aldegonde to decipher an "easy" cipher, although there was a decipherer in England such as Somers mentioned above. P.S. It is very important to her Majesty's service to have this letter of the ambassador of Portugal deciphered with speed. Please therefore deal earnestly and speedily with St. 'Alagondye' in that behalf. The cypher is so easy that it requires no great trouble. In 1581, the Spanish found out St. Aldegonde's deciphering of a cipher of the Archduke Mathias, who had been Goveror-General of the Netherlands by the invitation of the States General of the rebellious provinces. Mathias returned to Austria when the Dutch denied sovereignty of Philip II in July 1581. According to De Leeuw, St. Aldegonde's achievement was not one of pure codebreaking. The Dutch were provided with Spanish code material for ten years by a Spanish clerk, John of Castil, who received a pension of 300 crowns a year from the Prince of Orange. In the end, he was caught and tried in 1581. (De Leeuw p.13, citing the seventeenth century historian P. Bor) However, according to a contemporary historian Luis Cabrera de Cordoba, the charge against this clerk was false and he was released (Javier Marcos Rivas, "LA CRIPTOGRAFIA Y LOS SERVICIOS SECRETOS DE FELIPE II", pdf). I am told that when two Flemish heretics and intimate friends of St. Aldegonde, asked him whether he had deciphered the despatches captured recently in France, he answered that it was very easy to do that as your Majesty's cipher was in so many hands, and drafts of letters could so easily be obtained. They were therefore anxious to get hold of cipher dispatches corresponding with the drafts, even when they were months old, because that enabled them to construct a key. He said the cipher in which all your ministers wrote was the same, and it was extremely difficult to obtain an original key. I am assured that Walsingham said something to the same effect, and that your Majesty's despatches could easily be understood by obtaining a draft of some letter written from a place where no suspicion existed; and after that, the valises of the ordinary couriers could be opened at night in the hostelries, the despatches extracted and afterwards returned to them again, which is perfectly simple. I myself have done this here frequently, getting hold of letters which I think will be to the interest of your Majesty to see, and in an hour, with a bone reproduction of the same seal, I make up a packet, closed in the same way, after having seen all I want to see, and the matter cannot be detected. I have heard since I have been here that when they deciphered Don John's letters in the States, it was done by means of Secretary Escobedo, who had a servant with him who wrote his cipher despatches. When Escobedo went out the man always accompanied him, leaving his papers in the trunks which, although they were locked, as well as the room they were in, and he had the keys, were just the same as if they had been left wide open, as there is hardly a room in Flanders of which the occupants have not two keys, in case one should be lost. The rooms were therefore entered and the locks of the trunks picked, which is easy anywhere, and much more so Flanders, where there are so many skeleton keys that will open any lock. François Viète (see below) later described that one of the first things to be done to attack Spanish ciphers was to compare letters sent to different ambassadors to identify variants of the same value (Pesic p.11). In the same letter as the above, Mendoza advised the King to use separate ciphers with ambassadors in different courts. Seeing how injurious it is to your Majesty's interests for the letters to be deciphered, and considering that it is almost impossible to prevent them from falling into the hands of enemies or false friends, as they are carried by couriers of various nationalities and are handled by postmasters owing no allegiance to your Majesty, whilst it is impossible for your Ministers to fulfil their duties and frankly report the state of affairs, surrounded as they are everywhere by enemies and heretics who are always on the alert, it would not be bad if your Majesty should order, in addition to the general cipher in the hands of all Ministers for ordinary correspondence, that three or four other ciphers for your Majesty's sole use should be distributed amongst the Ministers, and the evil of having only one cipher would thus be obviated. As it is now, directly a courier is rifled in France they understand, by means of a draft taken perhaps elsewhere, all that is written to your Majesty with regard to England, France, and Flanders, which they would not do if these ciphers were various. Another advantage of this would be that, if any of the clerks play false, they can be traced at once, which is not possible now, as they all write the same cipher which is in so many hands. It is of no importance that those who write to the Ministers in Italy and elsewhere should be so careful in writing the ciphers and keeping the papers, but if I or my people are not scrupulous great danger may result when the cipher we use is the same. I know how bold it is for me to write this and I humbly beg for pardon, but I am in a place where at this time affairs are of such importance in the service of God, that if the Queen and her Councillors should imagine, much less hear, what was going on they would frustrate it, and I am therefore obliged to say this, and to send all my despatches in cipher. Your remarks about Aldegonde's assertion respecting the cipher used in my despatches, and your suggestions for greater security, are noted with approval. Your proposal that a special cipher should be given to each minister who left here has been adopted for some time past, and in this special cipher the minister writes to me alone, the general cipher being used for correspondence of one minister with another. As you say, truly, you in your present position need a private cipher more than any other minister, and a new one shall be sent to you. Use of separate ciphers for matters requiring more secrecy is also attested by the following instruction given to Diego Guzman de Silva, ambassador in Venice. Whatever is to be kept secret should be written in ciphertext for which you use the general one that I use with all my ministers, and the personal one is used for when the business is so secret that it suits better than the general one. The Dutch continued to supply deciphering to England after the death of William of Orange in 1584. In March 1585, his son Maurice sent Walsingham deciphering of letters from Bernardino de Mendoza to the Prince of Parma. Knowing your friendship to my late father, and the good correspondence you have had together in affairs touching the church and state of the kingdom of England and of these countries; and there having fallen into my hands certain letters from Don Bernardin de Mendoza to the Prince of Parma, by which appears part of the negotiation in France, I send them to you but as they have been deciphered and as we must keep this cipher secret, for reasons which you know better than I do, I beg that this communication may not tend to our prejudice as regards other like letters. A decipher of a letter from Mendoza to the Prince of Parma dated 17/24 February 1585 is found here, which indicates some of the original ciphers with (uncertain) readings: gi(heretics), lem(common bruit), sul(the States), 67(enemies), 74(?Scots), 96(?France), 98(?the French). At this time, St-Aldegonde was burgomaster of Antwerp under the siege of the Prince of Parma, who had taken over the rule of the Netherlands when Don Juan died in 1578. Blamed for the surrender of the town in August 1585, he retired from public affairs (Wikipedia), though he continued to provide service in codebreaking. In April 1590, a letter deciphered by St-Aldegonde revealed that the King of Spain had his eyes on Cleve (Thomas Bodley to Burghley, 28 April 1590 DCB/001/HTML/1358/008). His another achievement for the Protestant King of France in 1590 will be mentioned below. Another deciphering in December 1590 is reported (DCB/001/HTML/0276/008). His decipherings in 1595 will also be mentioned below. The Dutch not only obtained intelligence from deciphering intercepted messages but also actively used the enemy cipher in an attempt to penetrate into the situations of the enemy under siege. In a few years from 1591, the young Maurice won a military fame by sweeping across the northeastern provinces. In the spring of 1593, Maurice laid siege to Geertruidenberg and the Spanish forces under the Count of Mansfeld were to relieve the town. In April, a letter from Francisco Verdugo, royal governor of several provinces , to the old Count of Mansfeld was intercepted and deciphered (Bodley to Burghley, 12 April 1593, DCB/001/HTML/0436/008). The Spanish sent a pigeon to the town with a letter in cipher of encouragement and promises of relief. The letter was taken and was soon deciphered. Then, the same cipher was used to cook up a forged letter and was sent into the town by the pigeon. The forged letter told the people in the town to give a signal by making two fires at a certain hour in the night, if they were reduced to a state to hold out only for two weeks longer (Thomas Bodley to Burghley, 18 April 1593; DCB/001/HTML/0027/008). Geertruidenberg was taken in June 1593 but it is not known whether the people made the signal before opening their gate. England was not without her own decipherer. A decipher of the Spanish ambassador in London, Mendoza, of about December 1583 is written by Thomas Phelippes (CSP, Foreign, Elizabeth, xviii), the cryptographer celebrated for breaking the cipher of Mary, Queen of Scotts, in 1586. The cipher uses figures and letters for codes such as 49(Elizabeth), gal(France? ), and rul(King of Spain?). Phelippes continued breaking Spanish ciphers one after another. 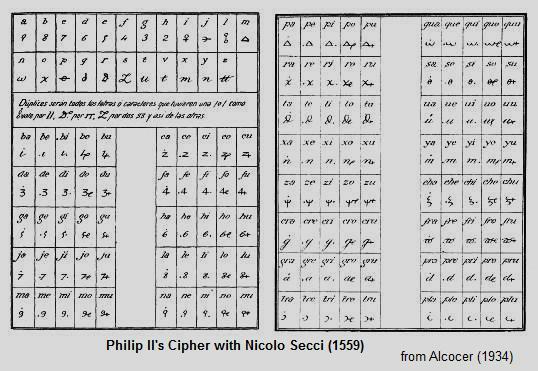 See another article for Phelippes' deciphering of Spanish ciphers in 1588-1590. At one time, he declared a single letter from Count Olivares concerning the Armada "held me twenty days in work." In mid 1590s, when Cecil and the Queen complained his work was slow, he pointed out that the Spanish continually deployed new ciphers in "such kind as will ask time to tread it out" and imprisonment (his talent was sought even during his imprisonment from the end of 1595 to mid-1595) denied him access to his records. Continual renewal of Spanish ciphers made essential the keeping of precise records of known codes and alphabets (Oxford DNB). Phelippes was by no means the first codebreaker in England. Nor was Spain unaware of such activities. As early as 1569 the Spanish were aware of deciphering activities in England. The letter of mine which they seized from the ordinary courier they will not return, but are trying to decipher it. I do not think they will do it so easily as they think, although all the letters for your Majesty and the Duke are in the general cipher. There is a copy of a cipher which bears a note "The great cipher sent in the year 1580" in French. This has a cipher alphabet but has no system for syllables except for defining symbols for monosyllabic words la, le, les, luy, ceulx. Ilz, quand, and car, Votre Majesté, and Prince de Parme The nomenclature includes numerical codes 10-685. Some common phrases can be represented by a letter with a dot on either side. In 1581, Philip II provided the Duke of Medina Sidonia a special cipher to be used only with the King. Sometimes, the business you are undertaking may be so serious, important and of such secrecy, that it would not be advisable to write it in general cipher, so for this purpose you are sent a personal cipher which will not be useful with the other ministers, only with me. In 1581, Philip II won the succession of the Portuguese throne and resided in Lisbon until February 1583. Philip II's letter dated at Lisbon, 15 August 1581 (draft) informed that there was suspicion that the general cipher then in use fell in the hands of the enemy and that a new cipher would be sent to the ministers (I lost the source but found it in Alcocer (1921), p.629). The new cipher, Cp.30 (1581), is dated 14 August 1581 (Devos p.279; Alcocer (1921) p.630), but an earlier use is recorded. The Annexe of Allaire (1997), reconstructed from a letter of 9 April 1579 from Juan de Vargas Mexia [Mejia], ambassador in France, to the King, is substantially the same as Cp.30. Devos notes the list of recipients of this cipher does not include the ambassador in France, Vargas Mejia, who had died in July 1580. It is wondered what kind of situation led the cipher used by the ambassador in France to be issued broadly one year after his death. Cp.30 is said to have been used only for a year (Devos p.279, Alcocer (1921) p.633). Much later, however, Cp.30 was also used in 1590 in the correspondence of Bernardino de Mendoza with Philip II and don Martin de Idiaques (BnF fr.3641, see another article). Cp.30 (1581) is similar to Cg.12 (1582) below in many respects. Basically, Cp.30 represents a letter by a substitute letter or a figure and also provides for a vowel indicator system for forming syllables. Somehow, however, the substitute letters are identical with the plaintext letters. (See another article for an actual specimen in which such trivial substitution was used.) (In Cg.12, the substitute letters are the one next to the plaintext letter, with "a" represented by "b", for example.) Still, specimens of letters from 1590 show that the occurrence of such telltale letters is relatively infrequent. Vargas Mexia, ambassador in France, was succeeded by Juan Batista de Tassis [or Taxis] in January 1581 but only with the rank of chargé d'affaires (CSP, Simancas, iii). Tassis' mission was to establish an alliance with the Catholic League in France led by the Duke of Guise. After the death of the Duke of Anjou, King's brother, in June 1584, the increased prospect of the Protestant King of Navarre ascending the French throne required Philip II to take a more active part in the French politics. A treaty dated 31 December 1584 was signed by Tassis and Juan Moreo on behalf of Philip II in the following January at the chateau of the Duke of Guise at Joinville on the Marne (e,g, Jensen). In 1584, Bernardino de Mendoza was expelled from England after his involvement in Throckmorton's plot against Queen Elizabeth. Later in the year, after the death of the Duke of Anjou, he was sent to Paris to take over from Juan Batista de Tassis the embassy in Paris (serving until 1590). He clandestinely worked for the Catholic League in France (his activities are detailed in Jensen) led by the Duke of Guise, who was not only opposed by the Protestant Henry of Navarre but was also viewed with suspicious eyes by Henry III. Most of Mendoza's despatches between November 1584 and June 1586 were in Cg.12 (Jensen p.123; Jensen appears to have reconstructed this cipher himself, unaware of it being a general cipher Cg.12, see p.291). Bernardino de Mendoza's hatred of Elizabeth and religious zeal drove him plotting with the Queen of Scots. In 1586, he was involved in the Babington Plot to assassinate Queen Elizabeth and put the captive Mary on the throne. The plot was discovered and Babington was executed in September 1586. This time, Mary's own acknowledgement of the "enterprise" was proven by her letter deciphered by the English authority. Mary was executed in February 1587. The cipher used in a letter of January 1591 between Alessandro Farnese, Duke of Parma and Filippo (Philippe) Sega, Duke of Piacenza is similar to Cp.30 and Cg.12 above. See another article in (Cryptologia). The tabulation of this cipher is somewhat similar to that of Cp.39 (1595) in that it consists of nine boxes and the head number specifies the top digit(s) and the line number in the box specifies the last digit of a code number. Jensen p.232 organized this into a "blocking in the square" representation, whereby each letter is assigned a block of coordinates in a matrix. He calls it "Tassis' table." It represents letters with two-digit numbers. The assignment indicates "0" follows "9" rather than being before "1". The cipher also includes a nomenclature which represents words with a number with an unerline ("41" for "cardenal", "87" for "cosa") or two to three letters ("am" for "porque", "ce" for "dicho", "xol" for "para", "pom" for "Rei de Francia"). A "+" sign above a number indicates the number itself. Arranging letters in a matrix reveals that this corresponds to Cp.37 with its ordering of rows reversed. Mendoza also used a numerical cipher with more irregular arrangement in writing to Juan de Moreo in April 1589 (BnF fr.3977, see another article). A plus (+) sign above a figure indicates doubling the letter. A circumflex (^) above a figure appears to indicate a null. Cg.14 is a short list of code names for important persons from the King to Bernardino de Mendoza (representing le duc de Guise by "Mucío") in 1585 with additional names noted by the Chancellery (including El duque de Guisa represented by "Curio"). (cf. Devos p.207). Jensen p.238 has "Silvio" for "The Duchess of Montpensier", not listed in Devos. In April 1587, Mendoza sent a numerical cipher Cp.32 (1587) (Jensen p.237 reproduces the original) he had made in England to Don Juan de Idiaques, Secretary of State and explained its advantages (see also Jensen p.124). It was basically a numerical code to regularly assign two- or three-digit numbers to syllables. This form of syllabic numerical cipher is used in some of the subsequent ciphers in combination with the traditional vowel indicator system. During the last years of his reign, Philip II was preoccupied with the matter of French succession. In August 1589, the assassination of Henry III left Henry of Navarre, a Huguenot, successor to the French throne. The succession, however, was opposed by the Catholic League, led by the Duke of Mayenne after the assassination of his brother, the Duke of Guise, in 1588. The League still commanded loyalty of most of the people and had control of Paris with the support of Philip II. In the spring of 1590, Henry of Navarre marched on Paris and, after a victory at Ivry, laid siege on Paris. Philip could not have a protestant on the French throne and the Duke of Parma, who had been conducting successful campaigns in the Netherlands, led his troops into France and relieved Paris in August. A note on one copy of this general cipher suggests that this was sent between 1590 and 1592, during which the Duke of Parma was diverted to France and the Count of Mansfeld was interim Governor of the Netherlands. The latter became official Governor when the Duke died in 1592 (Devos p.197). The cipher extensively used between Bernardino de Mendoza and Philip II in 1588 and used alternately with other ciphers after November (Jensen p.125, 238) appears to be this. The present author confirmed that this cipher was used by Philip II, Duke of Parma, and Bernardino de Mendoza in 1589 (BnF fr.3641, see another article). François Viète, who started use of alphabetic symbols for quantities in algebra, performed codebreaking for Henry. He had deciphered a depatch to the Duke of Parma dated 30 December 1588 (Devos p.59, Kahn p.116). In 1589, letters between Philip and commander Juan Moreo (who was sent to France in 1589 (Devos p.44, 328) to support the Duke of Mayenne) and ambassador Mendoza ("Mendosse" as gallicized by Viète) were intercepted and forwarded to Viète. Moreo's letter dated 28 October 1589, recommending Philip to divert the Duke of Parma's force to France, was not completely deciphered until 15 March 1590, the day after Henry's victory at Ivry. In the letter accompanying the solution, Viète said "They have changed and rechanged [their ciphers], and nevertheless have been and always will be discovered in their tricks." Viète proved the veracity of his statement by continuing to decipher despatches of Spain and other courts. (Kahn p.116-117, Pesic p.4) Possibly due to such confidence, Viète published his decipher of Moreo's letter in a pamphlet in 1590 despite the danger of inducing the enemy to change their cipher (Pesic, p.4). In 1595, a letter in cipher from Father James Gordon, a Scots Jesuit, to Spain was intercepted and deciphered by the French, possibly by Viète (Letter of Thomas Bodley, 14 March 1595, DCB/001/HTML/1243/008 ; see Catholic Encyclopedia for background). It appears Viète also deciphered a cipher (Cp.57) with the Duke of Sessa, apparently used around 1600-1601 (see another article). Cp.38 is a cipher for use with Juan Moreo. The cipher deciphered by Viète was analogous to this cipher. Its nomenclature represent common words by underlined numbers 0-99, alphabetical codes ba, be, ..., zu, bal, bel, ..., zul, bam, bem, ..., sum, and 36-98 with two dots above. Juan Batista de Tassis, who had returned to Brussels after his embassy in Paris during 1580-1584, was again given a mission in France in 1589. Tassis accompanied the Duke of Parma in his campaign in 1590 to relieve Paris and another in 1591-1592 to relieve Rouen. (Devos p.47, 300) In May 1593, Tassis addressed the Estates General convoked by Mayenne and the Catholic League and formally proposed Philip's candidate for the French throne, Infanta Isabel, granddaughter of Henry II (Kamen p.298-299). There is no evidence to attribute this particular cipher Cp.33 of Philip II with Juan Batista de Tassis to either of his missions. It has a cipher alphabet consisting of mainly Arabic numerals; symbols for representing two-letter codes (a base symbol derived from the cipher alphabet plus a vowel indicator); and a nomenclature. 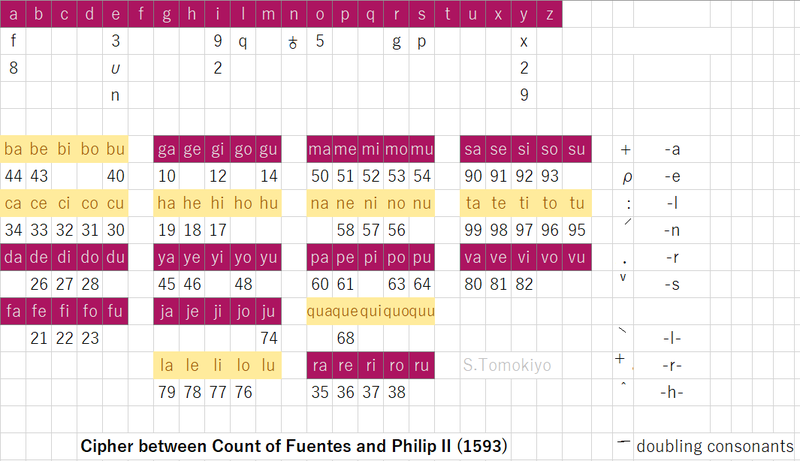 A syllabic numerical cipher similar to Mendoza's Cp.32 (representing syllables with two-digit numbers) was used in 1592 among Philip II, Duque de Parma, Duque de Feria, Duque de Sessa, Conde de Acuna, Conde de Olivares, Conde de Fuentes de Castilla, Juan Batista de Tassis, Don Diego de Ibarra, and Andrea Doria as well as Conde de Miranda (BnF fr.3641, see another article; BnF fr.3982 f.189; BnF fr.3983 f.98, f.158, f.162). This is substantially the same as the cipher printed in Monts de Savasse (1997), used by Enrique de Guzman, Count of Olivares (Wikipedia). In addition to figures representing syllables, the traditional vowel indicators are provided. This allows more than one way to represent syllables. Moreover, this cipher uses not only vowel indicators but also signs for indicating consonants. An umlaut doubles the letter. Numbers with "++" above are: 4(mas), 31(nulla). Numbers with three dots above are: 94(de), 95(de), 31(servicio), sempre(34), 40(sospeschas), 49(s.sd), 88(VMd). Numbers with a bar below or an umlaut above represent words. For example, "49" with a bar below represents "despacho". In addition, there are two- or three-letter symbols representing words ("hu" for "Francia", "ris/rus/ros" for "de", "ses/sis/sos" for "que", "vul" for "otro", "xul" for "pues", "pis" for "VMd"). Yet another similar numerical cipher was used in July 1593 in the correspondence of Count of Mansfeld, Duke of Feria, and Don Diego de Ibarra in Paris (who succeeded Mendoza) (BnF fr.3984, f.130, 145). Numbers with a bar below represent the number itsef. There are also three-letter symbols representing words ("vas" for "segnor"). A letter from Gregorio de Miranda to Bernardino de Mendoza in April 1592 used a very simple numerical cipher (BnF fr.3981 f.145; online catalogue). 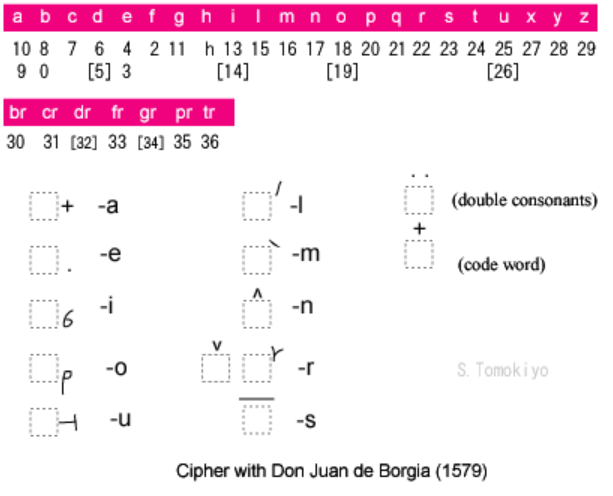 This cipher is for Philip II, Duke of Ibarra, don Juan de Aguilar, and don Mendo Rodriguez de Ledesma. The Duke of Ibarra and don Mendo Rodriguez de Ledesma negotiated with the Catholic League (Devos p.304). It was used in letters of Don Diego de Ibarra in Paris to Philip II and Don Juan de Idiaquez in November 1592 (BnF fr.3641, see another article). This cipher substitutes a letter for another with some homophone symbols for a, e, i, o, u (Apparently, the homophones for "n" in Devos (1950) should be assigned to "o". At least, one of them "7" is confirmed to indeed represent "o" in BnF fr.3641 f.99v). Syllables are formed by vowel indicators. The nomenclature represents words by two-letter combinations. Cp.35 is for use with Count Charles of Mansfeldt and Cp.36 is for use with Monsieur Richardot. They are identical except for being in reverse order. They are a monoalphabetic substitution cipher wich a nomenclature representing words with two-letter symbols or numbers 7-99. Cp.35 has one additional entry for "Turquie", to which a special symbol is assigned. This was used in November 1592 (BnF fr.3641, see another article). There are three-letter symbols representing common words ("hil" for "V.M. ", "fry" for "nadar"). This was used in January 1593 (BnF fr.3641, see another article). The cipher Cp.39 (1595), bearing a signature of Esteban de Ibarra, was for Juan Batista de Tassis, who had been named member of the Council of State of the Netherlands in January 1595. The tabulation of this cipher is characterized in that it consists of many boxes, in which the number at the head specifies the top two digits and the line number (1, 2, ..., 0) in the box specifies the last digit of a code number. A letter of 1595 reports St-Aldegonde's deciphering of a letter to Ibarra about use of galleys upon the coast of Flanders for cutting the trade of Holland and Zeeland (Thomas Bodley to Burghley, 17 August 1595 DCB/001/HTML/0486/008). Later in 1595, a letter in cipher by Tassis was intercepted in the Mediterranean and deciphered by St-Aldegonde to reveal falsehood of the King of Spain towards both the Emperor and the States (26 November 1595, DCB/001/HTML/0778/008). Num.34 of Alcocer (1935) is a simple substitution cipher with homophones for vowels plus about 20 two- or three-letter symbols for some names. It was for use with Juan Batista de Tassis. Philip II's position about the French succession was largely undermined by Henry IV's declaration of his conversion to the Catholic faith in July 1593. In 1594, Henry IV was crowned and entered Paris. Spanish troops were allowed to march out with military honours. Some Catholics, still suspicious of the sincerity of Henry's conversion, were against Henry IV with the support of Spain and in 1595 Henry declared war on Spain. This is a cipher "que me baillia l'Audiencier Verreycken avant de partir. De Bruxelles, le 28 avril 1599" and bears a note at the end "Envoyé de Madrid au mois de janvier 1593", which Devos considers an error of the copyist. Louis Verreycken was first secretary of state and audiencier in the Netherlands from 1578. He was one of the deputies of the King of Spain in the negotiations for the Treaty of Vervins in 1598 and Twelve Years' Truce with the Dutch in 1609, among others. The cipher alphabet consists of arbitrary symbols, some of which resemble arabic numerals or Greek or Latin letters. The nomenclature includes numerical codes 30-160, which cover not only names and words in French but also phrases such as Préjudice à la religion catholicque (116), L'on doibt soigneusement garder (117), and Sont affectionnez à la paix (131). This is similar to Cg.11 (1580) also in French in the coverage and symbols of double letters (bb, cc, dd, ff, gg, ll, mm, nn, pp, qq, rr, ss, tt, vv). One word Vostre Maiesté has a special symbol assigned to it. This is a copy of a cipher entitled "Cipher of Monsieur l'Audiencier with ministers of Spain" in French. "Monsieur l'Audiencier" is the title usually given to Verreycken. The cipher alphabet consists of arbitrary symbols, some of which resemble arabic numerals or Greek or Latin letters. The nomenclature includes numerical codes 20-129, which cover not only names and words in French but also some phrases such as Préjudice de la Religion catholicque (106), Lon doit soigneusement garder (108), and Sont affectionnez à la paix (127). The vocabulary is different from but similar to that of Cp.42. This is a copy of a cipher used during the conference at Vervins. The cipher alphabet consists of arbitrary symbols, some of which resemble arabic numerals or Greek or Latin letters. The nomenclature includes numerical codes 20-142 for names and words in French. Symbols of double letters bb, cc, dd, ff, ll, mm, nn, pp, qq, rr, ss, tt, uu) are defined. In December 1597, Catalina died of a childbirth. The grieved King survived his daughter by less than a year. Primitive ciphers tend to use non-alphanumeric symbols but ingenuity in the design of symbols contributes little to the security of the cipher. During this period, Italian ciphers predominantly used Arabic numerals but Spanish ciphers still used a variety of symbols. Cg.1 (1556) Arbitrary symbols, alphabetic letters, and Arabic numerals. Cp.15 (1559) Arbitrary symbols, alphabetic letters, and Arabic numerals. Cg.2 (1562) Arbitrary symbols, alphabetic letters, and Arabic numerals with a superscript circle. Cg.3 (1564) Arabic numerals with an overdot. Cg.4 (1567)/Cg.6 (1571) Arabic numerals. Each vowel additionally assigned a substitute letter and a non-alphanumeric symbol. Cp.18 (1567) Arabic numerals, alphabetic letters, arbitrary symbols. Cg.5 (1568) Arabic numerals and a couple of non-alphanumeric symbols. Cp.20 (1568) Arabic numerals, alphabetic letters, arbitrary symbols. Cp.21 (1570) Alphabetic letters, arbitrary symbols. Cg.7 (1572) Arabic numerals, alphabetic letters, and arbitrary symbols. Cg.8 (1572) Arabic numerals for a-v and permutations of x, y, z. Additionally, A, E, I, N (typo in Devos (1950)? ), V are assigned substitute letters L, M, N, R, S.
Cg.10 (1575) Arabic numerals and alphabetic letters. Cp.29 [1569-1578] Arabic numerals and arbitrary symbols. Cp.28 (1577) Arbitrary symbols and dotted vowels. Cp.31 Alphabetic and other symbols as well as those with some appendix strokes. Cg.11 (1580) Arbitrary letters, Arabic numerals, and alphabetic letters. Cp.30 (1581) Arabic numerals, alphabetic letters (which look like merely cursive versions of the plaintext letter), and some arbitrary symbols. Cg.12 (1582) Arabic numerals, alphabetic letters (Caesar cipher with displacement by one position), and some arbitrary symbols. Cg.13 (1587) Arabic numerals, alphabetic letters, and some alphabet-like symbols. One characterizing feature of Spanish ciphers is the vowel indicator system, in which syllables are represented by combination of a base symbol and a vowel indicator. Cg.3 (1564) Two-letter syllables: Arabic numerals for ba, be, ..., vu. Base symbol (alphabetic letter)+vowel indicator for xa, xe, ..., zu. Three-letter syllables: Two- or three-letter codes. Cg.4 (1567)/Cg.6 (1571) Two-letter syllables: Base symbol (Arabic numeral) derived from the cipher alphabet + vowel indicator. Cp.18 (1567) Two-letter syllables: Base symbol derived from the cipher alphabet + vowel indicator. Cg.5 (1568) Two-letter syllables: Base symbol (Arabic numeral etc.) derived from the cipher alphabet + vowel indicator. Cp.20 (1568) Two-letter syllables: Base symbol derived from the cipher alphabet + vowel indicator. Cp.21 (1570) Two-letter syllables: Base symbol derived from one of the two series of the cipher alphabet + vowel indicator. Cg.7 (1572) Two-letter syllables: Base symbol (alphanumeric symbol) derived from the cipher alphabet + vowel indicator. Three-letter syllables: Symbol for corresponding two-letter syllables + a bar. Two-letter syllables: Base symbol derived from the cipher alphabet + vowel indicator (either dots/strokes or numerals 5, 4, 3, 2, 1). Three-letter syllables: Base symbol unrelated to the corresponding two-letter syllable + vowel indicator. Cg.8 (1572) Two-letter syllables: Base symbol (Arabic numeral) derived from the cipher alphabet + vowel indicator. Three-letter syllables: Base symbol (capital or small letter of the plaintext letter) + vowel indicator. Three-letter syllables: Symbol for corresponding two-letter syllables + a hat or a hacek. Three-letter syllables: Base symbol (Arabic numeral) unrelated to the cipher alphabet + vowel indicator. Two-letter syllables: Arabic numerals 2-101. Three-letter syllables: Bar over or below corresponding symbol for two-letter syllable. Three-letter syllables: Base symbol unrelated to the cipher alphabet + Arabic numeral above to indicate the vowel. The nomenclature part of Spanish ciphers ("code" in the modern parlance) is characterized by mixed use of letter codes and numbers, occasionally with diacritic signs. Use of letter-codes and diacritic signs seem to be partly for the purpose of supplying the necessary vocabulary without using three-digit numbers. Most nomenclatures at the period use only numbers up to 99, albeit the exceptions of Cg.8 (1572) (up to 187), Cg.10 (1575) (up to 150), and Cg.11 (1580) (up to 685). A century later, the general cipher Cg.51 (1676) still used a mixed nomenclature including one- to three-letter codes as well as numbers. It was only in the last quarter of the seventeenth century that Spanish nomenclatures were composed entirely of Arabic numerals. Cp.15 (1559) Two-digit number (99-30) and two-letter codes: ba, be, ... (French vocabulary). Cg.2 (1562) Mainly three- or four-letter codes Dal, Del, ..., yim, yom, Bla, Ble, ..., Bru interspersed with numbers 20-99. First eight elements are derived from a Latin phrase: "Ab", "jo", "ve", "prin", "çi", "pi", "um". Cg.3 (1564) Arabic numerals 12-99 with an overbar, three-letter codes cas, ces, .... The word "Papa" is assigned a special symbol like "A." Cp.18 (1567) Two- or three-letter codes, Arabic numerals. Cg.5 (1568) Two-digit Arabic numerals and those with an overbar. Two- or three-letter codes. Cg.8 (1572) Two-letter codes ba, be, ..., three-letter codes bla, ble, ..., Arabic numerals 24-187. Cg.10 (1575) Arabic numerals 0-150 (some are with an overbar), two-letter codes ba, be, ..., zu, another series of Arabic numerals 16-99, three-letter codes bas, bes, ..., vos. Cp.28 (1577) Every word has two symbols. One is two or more letters, derived from a Latin passage. The other is alphabetical or other symbols occasionally with a bar. Cp.31 A single alphabetical or other symbol with a superscript Arabic numeral, dots, etc. Cp.30 (1581) Arabic numerals 38-99, two-letter codes ba, be, ..., three-letter codes bal, bel, ..., Arabic numerals 0-150 with a plus sign above. Juan de Tejeda, Governor of Cuba (Wikipedia) from 1589 to 1593 (1591, Plate 8). These appear to be simple ciphers assigning a non-alphabetic symbol to each letter of the alphabet. The last two assign special symbols to a few high-frequency words. Viceroy Toledo's cipher includes symbols for double letters "LL" and "RR". J. G. Carmona (1894), Tratado de criptografía con aplicación especial al Ejército, Ministerio de Defensa, reprint in 2011; Appendices 5 and 6 list ciphers in the archives. First posted on 17 April 2011. Last modified on 23 March 2019.